The Fraser Valley has a few wineries, but they are not as well-known as our Okanagan wineries. One of the newer Fraser Valley wineries is Singletree Winery from the Abbotsford area. Being a cooler climate area for grape growing, expect aromatic white wines. But as many of the Fraser Valley wineries do, they also bring in grapes from the Okanagan for warmer climate grape varieties, like Merlot or Cabernet Sauvignon. For this article I will be reviewing 3 of their white wines; 2 single varietal, and 1 white blend. But before I do, a quick question for you. 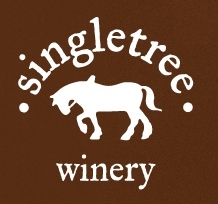 What does Singletree represent at Singletree Winery? Is there only 1 tree on their property, or something else? Examine their wine label for a hint! 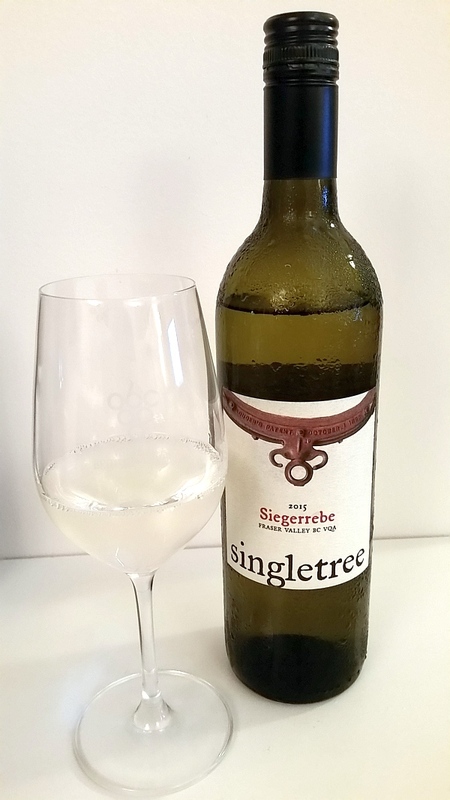 Singletree Winery Siegerrebe 2015 (~$16) – Siegerrebe is an aromatic white grape variety. It is a cross between Gewurztraminer and another grape variety, and it does share some of the Gew character. This wine has a very pale straw colour in the glass. It has a medium intensity nose, with lots of flowery perfume, lychee, and sweetness. You also get hints of lime and orange. It is quite a pretty nose. The wine is a bit sweeter than off-dry, but does have above average acidity that does help to balance it out. The wine is medium bodied, has a light acidic prickle and a waxy feel. That waxy feel is similar to what I get from some Chenin Blanc wines. It has lychee and pine needle flavours up front, with pears coming in mid palate, and a hint of peach. It has a medium plus length, with stone fruit, pine needles, lychee, apples and oranges on the finish. The wine is straight forward,and may be a good wine for those people who prefer sweeter, lighter wines. 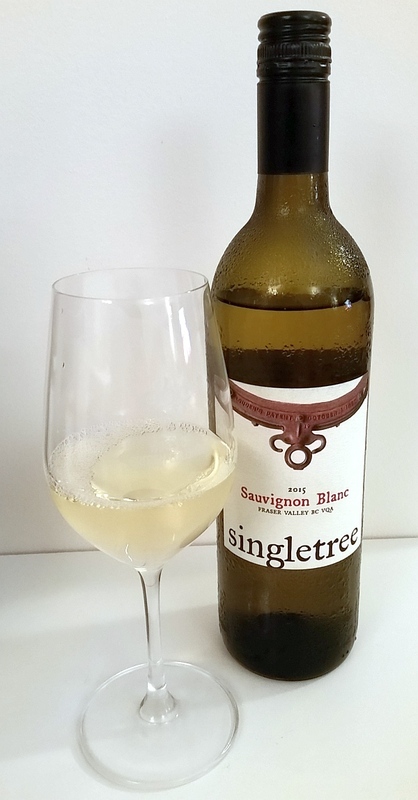 Singletree Winery Sauvignon Blanc 2015 (~$22) – Have you ever heard of a Fume Blanc wine? It is the result of fermenting and/or aging Sauvignon Blanc grapes in oak barrels. It became most famous through the Robert Mondavi winery, who coined the term. This particular wine was barrel fermented in a mix of new and neutral oak. It has a pronounced nose with ripe tropical fruit, vanilla and light toast aromatics. It smells very similar to an oaked warm climate Chardonnay. It is dry with very high acidity. Ripe,full and round, with a heavier mouthfeel. Very intense tropical fruit together with toasted oak that transforms to a more charcoal flavour, along with some citrus in the background. It has a medium plus length, leaving you with an acidic prickle on the tongue, and flavours of smoke, toasted oak/charcoal, tropical fruit and vanilla. This wine is not shy on oak, and has lots of tropical fruit flavour, so you will need to pair this wine with a strongly flavoured dish, like a Boudin Blanc (recipe here). If you blind tasted this wine, you would probably guess that it is an oaked Chardonnay. Rating: A fuller bodied Sauvignon Blanc, full of tropical fruit and oak on the nose and palate. If you like oaked Chardonnay, you will like this wine. 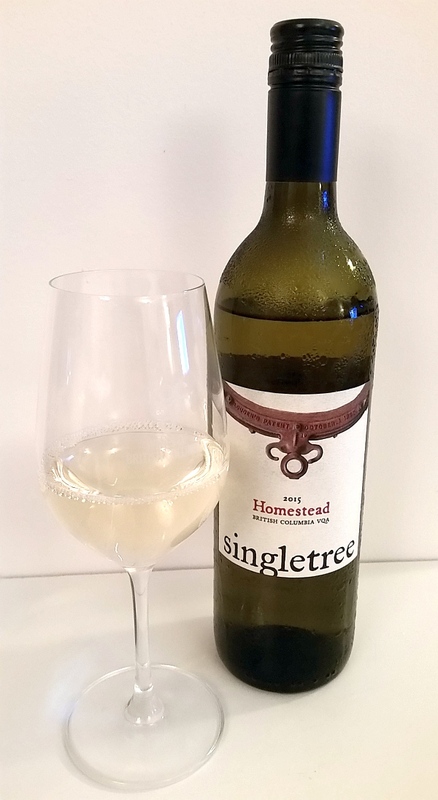 Singletree Winery Homestead 2015 (~$20) – Homestead is a blend of 45.9% Pinot Gris, 23.4% Gruner Veltliner, 17.9% Chardonnay, and 12.8% Kerner. It has a very light nose,with aromas of stone fruits and flowers. With decanting it adds a honey note. It is dry with above average acidity. It is dry, with an overall light, delicate mouth feel. Light acidic prickle on the tongue. It is hard to pick apart the fruit flavours that make up this blend, but I do pick up varied stone fruits, citrus, and a hint of lime rind. With decanting you also get some floral perfume. The wine is quite tart on the finish, but it tones down a bit with decanting. You get bitter rind, citrus, and some leafiness on the finish. Quite interesting, is that with decanting this blend gets peppery on the finish. Decanting this wine a bit helps to soften the wine. I think that this wine has an opportunity to improve with 2-3 years of aging. Rating: An overall, light delicate white blend, that is quite tart, and has a mix of stone fruit flavours. Give it a little decant to soften up the acidity. Have you figured out what is a “singletree”? If not, it is a metal bar that goes behind a draught horse to help guide it as the farmer ploughed their fields. Did you see it on the Singletree wine labels?